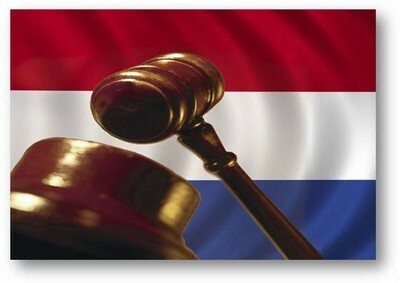 It is the largest terror trial in the Netherlands since the murder of Theo van Gogh in 2004, and one of the largest in Europe since the 9/11 attacks: ten Muslim extremists, all accused of being members of a terrorist group and of recruiting others for jihad. Now it may all be about to unravel, allowing eight of the accused to walk free. The other two are believed dead, "martyred" in the Islamic State. The defendants in the case are accused of conducting secret meetings to discuss jihad activities and of recruiting others via social media and in public. Some, particularly Azzedine Choukoud, the network's alleged leader, and Rudolph Holierhoek, are also accused of giving speeches and publishing statements and articles online that praise ISIS and their jihad. The trial has held challenges from the start. As one defense attorney argued, much of the evidence crosses into questions of free speech. Can praising a terrorist group constitute a criminal act? Is talking about a desire to join ISIS actually a crime? Or are such comments protected under laws of free expression? Where – and how – can lawmakers draw the line? Others accuse police investigators of entrapment, arguing that a sham Facebook account they created to lure ISIS fans to connect and share pro-jihadist material went too far. That account, created with the permission of the Dutch courts, was managed by an unnamed agent in order to post videos and texts in Dutch and Arabic, along with incendiary photos, under the pseudonym of "Aboe Noewas." As a result, "Noewas" was invited to "friend" ISIS recruiters and others from the network, including Azzedine Choukoud (also known as Abou Moussa).Through such connections, "Noewas" gained access to the private conversations shared among the terror group's members and with their other Facebook friends. But the agent behind the "Noewas" profile was specifically directed only to accept "Friend" requests, not to initiate them. Yet some evidence suggests that he ignored this restriction, soliciting contacts directly. Moreover, the alleged terrorists seem to have shared amongst each other a photograph and accompanying text originally posted by "Noewas." If true, this could be viewed as entrapment. These glitches have now forced Dutch officials to examine the conversations and "shares," and provide evidence that the comments left and materials shared and posted were neither planted nor coerced. That should be easy enough: just call up the account. Except that once the investigation ended, the account was closed down, and in accordance with Facebook policy, all its activity deleted. While the police saved copies of the suspects' comments, they failed to do the same with "Noewas's" own posts. This is no small matter. The nine men and one woman on trial reportedly form "the jihadist network of the Netherlands," according to newspaper Algemeen Dagblad (AD). They allegedly meet regularly in apartment building basements to plan strategy and listen to lectures by other radicals and recruiters. Several in the group participated in the violent anti-Semitic, pro-ISIS demonstrations in the Schilderswijk neighborhood of The Hague during the restless summer of 2014. Others have fought in Syria, where some were killed and a few are still engaged. At least two have returned home, bringing with them the jihadist training they received there. With the delay in the trial, officials decided on Monday to release one suspect, Rudolph Holierhoek, a Muslim convert and the son of a Dutch judge. The 26-year-old redhead, known for his Internet savvy, has spent the past year in the terrorist wing of a high-security prison in Vught. In deciding to release him, the Volkskrant reports, the courts took into consideration his "personal situation" as a student and a father. He remains under watch, however, and may not leave the country. He also must surrender his passport and stay off of social media. Active in the past in many pro-ISIS and pro-jihadist events, he is now banned from taking part in any public demonstrations. Holierhoek will be required to attend the trial when it reconvenes, presumably with the missing evidence recovered. But one has to wonder what the situation would be had it never been lost to begin with. Interestingly, after the vile murder of British Fusilier Lee Rigby in May 2013 by Michael Adebolajo and Michael Adebowale, two jihadists active on Facebook, administrators at the social network promised to aid governments identify terrorist suspects who used the site either to communicate or to spread jihadist propaganda. Why they never reported any members of this particular Dutch group remains unclear; but their commitment to prevent incidents like Lee Rigby's killing and other terrorist attacks suggests that they may well have noted – and kept – the materials posted by "Noewas," who was, after all, posing as a terrorist himself. In an email, a spokesman for Facebook in the region confirmed that "content that is removed from Facebook is indeed completely removed from Facebook" within a few weeks. If law enforcement fails to request access within that time, "then it simply can't be found," wrote Demaris Beems. If Dutch officials are unable to retrieve the suspects' Facebook exchanges, the outcome will extend beyond the frightening release of the suspects: they've disclosed a key tool in monitoring and combating ISIS recruits and have nothing to show for it. As a consequence, such exchanges are likely to go further underground, making future investigations significantly more difficult – and probably not only in the Netherlands. All of which raises new arguments for those who support collecting and preserving data – practices that have been under fire internationally since the exposure of America's PRISM program by Edward Snowden in 2013. Yet just as body cameras are now being used by U.S. police to monitor their activity – particularly in cases of aggression against black suspects – such data collection programs can also help protect innocent victims from overzealous counter-terrorism teams who might otherwise plant material or coerce suspects to say or do things that could be self-incriminating. On the other hand, those same data collection programs can also provide precisely the information and the evidence needed to convict the terrorists lurking in our streets, plotting our destruction in the basements of our homes. Time will tell what Facebook's records have been preserved, and what, if anything, its officials decide to share with the Dutch prosecutor's office. But the case itself confirms the importance of permitting such data to be stored: it allows us all to know the truth. And in that, we are all made safer.